Quick - think back when you were 17 years old, what were you doing? Quick – think back when you were 17 years old, what were you doing? Hanging out with friends at the mall? Thinking about your crush on that cute boy or girl in science class? Trying to figure out if algebra would ever have any use after school? (Hint: not really). If you answered yes to any of those questions, you realize you were like a lot of other kids growing up, with their typical teenage angst over dating, arguments with their parents, and in general, wondering about their future. But what if at 17 you were really good at something, so good in fact, you knew exactly what you were going to do when you grew up? And, in fact, already you had done it at a world class level? Well, then, welcome to the world of Tristan Nunez. Don’t know him? 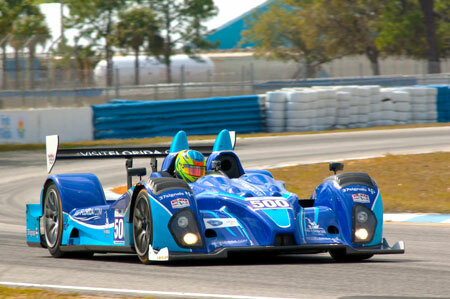 You soon will, because Floridian Tristan Nunez has hit the hyper drive on his career choice and is fast (and we do mean fast) becoming one of the better-known athletes in his sport of motorcar racing. Tristan races on the Grand-AM & American LeMans circuit as part of the Rolex Sports Car Series and to say he’s doing well is an uderstatement. In 2010, he was named Rookie of the Year in the Skip Barber Southern Series before advancing to the next level of competition and winning the points championship. He followed up in 2011 by becoming the youngest driver (15 at the time) to hit the podium in an International Motorsports Association (IMSA) sanctioned event when he finished second in his first race! By 2012, his first full season as a rookie driver racing IMSA Lites, Tristan kept the magic going by winning 11 races and finishing in the top 5 an astonishing 13 times. He’s already raced overseas in England as part of the 2012 Team USA Scholarship program, and competed in the Formula Ford Festival for the Silverstone Cup, winning the latter and its prestigious Walter Hayes Trophy. How did he get so good so fast? Well, like a lot of things in life, it took failure at another endeavor for him to discover racing. "My brother, Dylan, was a very good junior tennis player, but I was just okay. I wanted to do something different and racing always interested me." He started with Go Karts, and then gradually made the change to motor cars; he now races against people twice his age at speeds exceeding 120 mph. And he’s not intimidated. "I always had a feel for car racing, it was natural to me, so the more I raced, the more confident I became." He credits his calm demeanor with providing him with the inner peace needed to compete at a high level – and a high speed. “I was raised to be calm”, he says quietly, “and I didn’t want to wreck, so that became a part of my style”, remembering that since he lacked some of the financial resources of his rivals, he had to be even more careful. Keep in mind he was doing most of this racing before he had his driver’s license! That’s right, on the weekends Tristan raced cars, where speeds regularly exceeded 100 mph, but during the week Mom had to give him rides to and from school, to the mall or anywhere else. He eventually obtained his license (scoring a perfect 100 on the test) but it was on one of those rides with mom where a near-tragedy turned into an opportunity. After nearly getting into an accident, Tristan decided he would now compete against a new foe – texting and driving. He has become a tireless advocate against distracted driving and was present at the inaugural Florida Distracted Driving Summit. Because of his unique talents, Tristan thinks his message will resonate with his peers. “Given that I’m not pursuing a traditional sport like most of my classmates, I thought as a race car driver, I’d probably have a better shot at influencing change with this message against distracted driving.” His campaign’s slogan: Dnt txt n Drv. He hopes it catches on nationally, and with daily reports of people crashing while texting, the need for his message seems greater than ever. 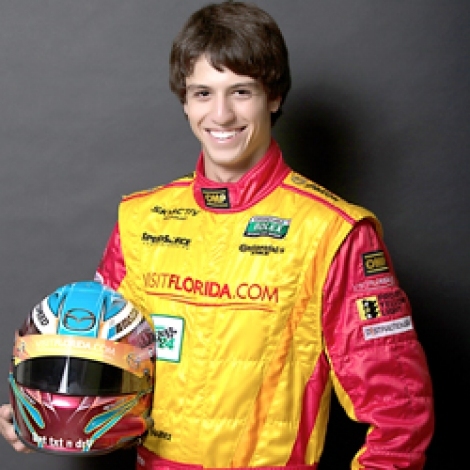 But, for now, this Boca Raton native is focused on his goal of becoming an open-wheel, Indy-style driver, the kind that races all over the world. His dream? Probably the international LeMans series, though for now winning in Detroit or Long Beach next month would be just fine. "I’m just trying to be the best I can be, "he says modestly. Or as Tristan might say, Bng #1 isbst. Just remember to say it while stopped.